Since 1965, Western American Literature has been the leading peer-reviewed journal in the literary and cultural study of the North American West, defined broadly to include western Canada and northern Mexico. We are constantly looking for new theoretical approaches to canonical figures as well as studies of emerging authors, filmmakers, and others who are expanding the canon of western literary and cultural production. While remaining grounded in the geography of the North American West, we will continue to explore new approaches to literary and cultural studies more broadly, such as our groundbreaking work in ecocriticism and scholarly support for the Hispanic Literary Heritage Recovery Project. To receive the journal, become a member of the Western Literature Association. For membership information, see Membership. 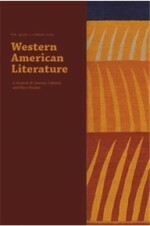 Individual articles are available at Project Muse: http://muse.jhu.edu/journals/western_american_literature/. For more information on the journal, please contact the editor, Tom Lynch. And follow journal news on Facebook: https://www.facebook.com/waljournal/ and on Twitter: @WestLiterature !